For most people currently running Windows 7, Windows 8 or Windows 8.1, there is a little stylized Window (the Microsoft logo) anchored to the bottom right of the screen (in what is called ‘the systray’). Sometimes it expands into a message written in broken English. [Windows 10 is coming. Get it for free.] You might think that it is a virus written by foreigners, but it’s not. Microsoft people actually wrote the phrase for free. 1. Open Installed Updates by clicking the Start button, clicking Control Panel, clicking Programs, and then, under Programs and Features, clicking View installed updates. 2. Click the update that you want to remove, and then click Uninstall. If you’re prompted for an administrator password or confirmation, type the password or provide confirmation. The update that you want to uninstall is called KB3035583. This is the one that you will choose to uninstall. There will be a lot of updates, so it may take a while to find this item. After it is uninstalled, one more step is necessary, because the update will come back. You’ll need to do the following. 1. Open Windows Update by clicking the Start button. 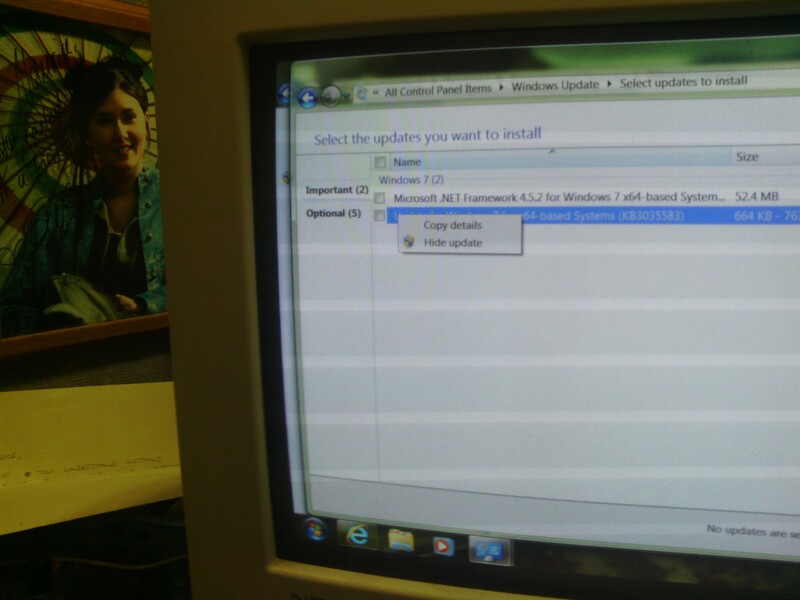 In the search box, type Update, and then, in the list of results, click Windows Update. 2. 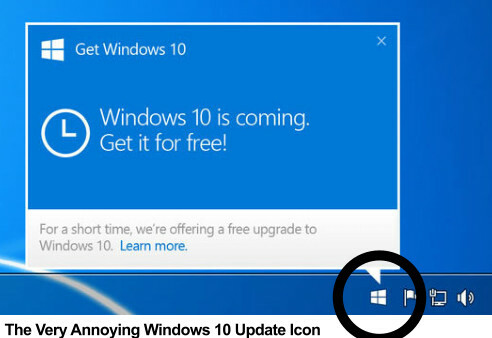 In the left pane, click Check for updates, and then wait while Windows looks for the latest updates for your computer. 3. If you see a message telling you that important updates are available, or telling you to review important updates, click the message to view and select the important updates to install. Now, look for update KB3035583, right click it, and then choose the option to hide it. Now, you’re done. The update will not come back unless you choose to restore hidden updates.